Gold, just the word brings to mind value, rarity, wealth, beauty and jewelry. But what is gold? Yes the scientists tell us gold is an element with the chemical symbol Au. We know it is the heraldic metal and it is a rare yellow mineral that is the most malleable and pliable of all metals. Yes, but what does that mean to me? Gold is a beautiful metal that is used to make timeless jewelry. Gold can be bent and molded into elegant engagement rings to show the eternal affection of one person to another. Gold is an expression of love. The key to understanding gold karat is the karat value over 24. An example is a 14 karat gold wedding ring. It is 14/24, which equals 58.3% gold and 41.7% alloy. In most engagement rings the stamp in the ring is 14k or sometimes 585. Both of those stamps mean the wedding ring is 14 karat gold. So the only pure gold is 24 karat gold which is sometimes called 999 gold. What does the term solid 14k gold mean? Some engagement ring are advertise as sold 14k gold which means the ring is made of 14 karat gold not just plated with gold. A plated piece of jewelry is a thin layer of gold over a base or non gold metal. Some plated jewelry has markings that look like real solid gold. For example, a plated piece can be stamped: 14k HGE or 18k GE. HGE means hydrostatic gold electroplating. Plated gold is measured in how many molecules of gold are around the ring. In other words, a plated piece of jewelry has very little gold. You can learn more about gold plating on our FAQ page. Some times engagement rings are stamped 14KP. The 14KP is a marking for plum gold which is a true mix of 14 karat gold. Some governments allow 13.5k to be stamped 14k so the 14KP tells the consumer this is a true 14 karat mix. Can there be other colors of gold engagement rings? Yes, Gold is yellow metal but adding copper to gold makes it redder and adding silver, zinc and any other metal makes gold paler. The white color is achieved by a careful choice of the alloying metals, which bleach the deep yellow of pure gold. It is interesting to note that white gold for engagement ring and wedding jewelry was originally developed in the 1920’s as a substitute for platinum. Nowadays, they are jewelry metals in their own right and currently very fashionable and desirable. White gold is available up to 21 karats. Most engagement rings are 14k or 18k. White gold is often used to enhance diamonds and other gemstones. White gold bridal jewelry is increasingly popular. What does GDH and 0.08 stand for on my 10k gold earrings? Hi Robert, thanks for commenting. Without seeing the earrings we can’t so for sure, but GDH is most like the manufacturer’s stamp. And, 0.08 is most likely the total carat weight of all the diamonds added up. Hi I recently bought a necklace and cross pendant from a mom and pop silver jeweler. The chain is clearly silver but my cross pendant has a 375 stamp followed buy a 305 stamp. I’m confused. Did I not buy a silver cross? Hello Marco, good question. Generally speaking, 375 means 9 karat gold which can be white or yellow in color. 305 is not a standard stamp. I would have to see this one in person to test it before I could say for sure, but from the stamp and your description is sounds like you have a 9k white gold piece. Is gold plated reduce the value significantly than that of real gold? I have an 18k GF ring with a huge topaz stone. Is my stone real if the setting is GF? I also have acquired a eternity circle diamond necklace. The chain says 925 Italy, but I’m not sure if the setting for the diamonds is white gold or silver which would make a difference in value I suspect. How can I tell the difference? Already read your article. Have any sure tests I can do at home? Hi Stephanie, thanks for commenting. Yes, a gold plated piece has minimal value when compared to a solid gold piece. This is because with gold plating, there is only a microscopic layer of gold with the rest of the metal being non-precious base metal (checkout our FAQ on gold plating to learn more). In the case of a gold filed ring (indicated by the GF you mentioned) there is slightly more gold (about 1/20th to 1/40th of the total weight normally), but the value is still vastly lower than a solid gold ring. Because of this, if the setting is gold filled (or plated) it is unlikely to have a valuable gem set in it. So, that would indicate that the large topaz may not be genuine, but without seeing it, we can’t say for sure. As for your necklace, it is stamped 925 which means that it is claiming to be sterling silver. You are correct that there is a significant value difference between silver and white gold. When it comes to testing at home, there aren’t any easy tests that have guaranteed accuracy. If you are not sure what metal a piece is made out of, you can always bring it by our shop, and we would be happy to test it for you at no charge. What does air solid stamp and RL stamp on gold chain mean? Hi Micheal, thanks for commenting. The air solid part indicates that the piece is hollow. As for the RL, that is most likely a manufacturer’s mark indicating who made the piece. I have a ring marked RD 10k and I don’t know what the RD signifies, any info on this would be appreciated. Hi Bob, thanks for reaching out to us. The RD portion of the stamp is most likely the manufacturer’s mark indicating who made the ring. Of course, it’s very difficult to identify which individual or company that may refer to. Hopefully that helps some, and feel free to contact us if you have any other questions. 1- I found a chain with ” 18 KG ” written on it but I don’t know what it’s does mean (the color of the chain is silver). 1. “18 kg” normally means that the chain is made out of 18 karat gold. However I would be happy to test it in person for you for free next time your in the neighborhood. 2. If there is no quality stamp like 18k etc. then there is a high possibility that the chain is not gold but costume jewelry. Although, without seeing it in person, we can’t say for sure. Hi, my name is Mani. I have a 14KT gold chain that also has PP-1 stamped on it & italy. If you could help me with any info on theses stamping I would greatly be thankful. Hi Mani, thanks for commenting. The 14k, of course, stands for 14 karat gold, and the Italy stamp indicates where the chain was made. The PP-1 is most likely a manufacturing stamp indicating what style of chain it is. This number will likely only have significance to the manufacturer. What does 14kl mean? The l in the 14kl? Hello Christoper, thanks for commenting. We are not aware of any special meaning of “l” after a 14k stamp. It is possible that the stamp was intended to be “14kt” for 14 karat gold but the cross bar on the “t” either was never fully stamped or wore off. Otherwise, the “l” is most likely a manufacturer’s mark indicating who made the piece. Hi, I bought a 22ct gold bangle for my wife from a high street retailer. On the inside of the are 2 very tiny holes, one on either side. The jeweller told me that it’s made like this so air can get in/out. Is this true? Hi Ali, good question. Without seeing the piece in person, it’s hard to say for sure what the holes are for. That said, we commonly see bracelets with holes like that which are used in the manufacturing process. There are many methods to making bracelets. If the bracelet is hollow inside and the gold feels “thin” then most likely when it was made the inside was filled with a material, think of it like wax. Then gold was wrapped around it, and the wax was melted out of the holes. It’s a bit more complex in reality but you get the idea. What does 10kn mean on a charm that I brought? Hi Shawn, thanks for asking. We’re not aware of any special meaning that stamp has. It’s possible the “n” is a manufacturer’s mark, but without seeing the piece, we can’t really say for sure. I wish we could be more helpful for you on this one. There is also a “WB” stamped inside. And next to that is “585” with a symbol above it of an ‘N’ in a heart an arrow. Would you have any information on what the WB stands for and/or why there is a symbol above the 585? Hi Robert, that sounds like an interesting stamp. Thanks for sharing. The N and WB are most likely manufacturing marks, but we’re not familiar with which designer they are used by. It is common practice for manufacturers to put their marks in close proximity to the quality stamp (585 in this case), so that explains why it is there. It helps jewelers to keep all of the stamps close together so there is more room to cut and size the ring without damaging the stamps. Hello, I have a white ring with beautiful little white stones stamped 925 and 18 K 6 E, any idea what this is and the worth, please? Hi Ina, thanks for commenting. Without seeing the ring in person, we won’t be able to give you a definitive answer, but from the stamps it is most likely a sterling silver ring with some 18k gold accents (these will often be yellow in color). The “6 E” part of the stamp may be a manufacturer’s mark or style number of some kind, but it doesn’t have a more general meaning that we are aware of. Another alternative is that the “18 K 6 E” part is actually “18K HGE” which would stands for Heavy Gold Electroplating. That would mean that the ring is silver that plated with 18k gold. You can learn more about gold plating on our FAQ here. As for the value, it would be really difficult to guess without at least seeing a picture of the piece. Feel free to email us any pictures/details you have or stop by the shop anytime we are open for a free value appraisal. Our yellow gold dome ring with diamonds is marked inside “PLAT 18K.” Is this ring really gold? Why is it marked PLAT? Thanks. Hi Barbara, good question. Normally, when a ring has multiple metal markings like that, it means that parts of the ring are made in different metals. In this case, I would think some part of your ring is white in color, maybe the prongs, and if so, that means those prongs are made out of platinum while the rest of the ring is made out of 18k yellow gold. That said, we would need to see the ring in person to say for sure. I have a gold rope chain with 10k stamped and on the other side AG stamped. What does the AG mean? Is my chain fake? Hello Shane, thanks for reaching out. AG is the symbol for Silver in the periodic table of the elements. However, it also could be the symbol for the manufacturer who made the chain so it doesn’t mean your chain is fake. Without seeing it in person, it’s difficult to say for sure one way or the other. We would be happy to test it for you for free, swing by anytime we are open. I have a piece that says m.o.e. and like a v circled on the pendant, but the necklace with it is gold 14k. Hello, thanks for commenting. The m.o.e. stamp and the circled v are both probably manufacturer’s marks (or maybe one of them is a Three Stooges references 😉 ). Either way, the piece may be 14k gold like the chain, but unless the pendant is stamped with a quality mark it is difficult to say for sure. If you are in the area, we would be happy to test it for you. Hi, is all 24K gold the same colour no matter where is comes from? Hi Patrick, good question. The short answer is yes, all 24k gold is pretty much the same color. However, keep in mind that when it is mined or panned out of a river, gold is not 24k. At best it’s 22k and it can go as low as 18k or lower. This lower purity gold will often not look like 24k ever after it is cleaned. It is only after the raw gold is refined and all the impurities are removed that we attain 24k or .999 purity gold which should all look the same. I have a hold ring marked “10kt 420 PG”. What does this mean? Is it likely plated or 10kt? Hi Sam, good question. I am not familiar with that exact stamp, so I would need to test that ring in person to be sure. But, I suspect the item is 10 karat gold and the 420 PG is a manufacturer’s stamp. I have a bracelet with stamped 375 (stamped on the ends of the bracelet in a little squire with long ends and pressed deeper) Italy on both ends of the bracelet. So, you are certain that it is gold (37.5%/9 carat) and not gold plated or something? I look forwards to your regards very much. Hi Fleur, thanks for reaching out. We can tell you that the stamp definitely says the bracelet is 9k gold. Unfortunately, there are unscrupulous people who stamp jewelry as gold when it isn’t, so we can’t always rely 100% on the stamp. If you are in the Sacramento, CA area we would be happy to test it for you, so you can know for sure. Feel free to bring it by the store anytime we are open. Hi Shin, thanks for commenting. We are not aware of any general meaning of 1152 with Arabic letters. The number and the letters are most likely either a style number/SKU or a manufacturer’s mark. If you are in the Sacramento, CA area, feel free to bring the pieces by the shop, and we would be happy to take a look at them for you. Hi there, I have a antique watch from my grandmother that is a Gruen with stamp 300733. I believe it is white gold with some diamonds in it. It has the stamp underneath that says WB014K. What does the WB stand for? Thank you!!! Hi Lauren, thanks for commenting. The WB is most likely a makers mark for the watch, and from your description it looks like you do have a 14k gold watch. The numeric stamp may be a serial number, but without seeing the piece in person, we can’t say for sure. I will tell a quick story. Found a ring, (estate clean out) it appears to have no imprints. My boss gave it to me while he took some 18k gold filled items and I received a 1905-1920s old mine cut 1.18 carat 0.3 x 0.3 on each side of the 1ct. Anything you can tell me about this? Just curious if you an idea. Oh and I just wanted to say thanks for your feedback appreciate your site! Hi Mark, thanks for the kind words. I’m glad the site has been helpful to you. You are correct, the SLO part is most likely a manufacturer’s mark. The 14k part means that there is approximately 58.5% pure gold in the ring with the rest being alloy metals. It sounds like you found a really cool ring there. We love Old Mine Cuts; they have such a unique sparkle. If you’re curious about its value, feel free to email us some pictures and any other details you have (gram weight, stamps, etc), and we would be happy to take a look for you. Hi, I have a ring stamped 375 italy. Is that a silver or a white gold? Hi Sheryl, good question. The stamp 375 indicates that the piece contains approximately 37.5% pure gold with the rest being alloy. This is also referred to as 9k gold. Hi dear. I just purchased a diamond ring that has 18KT 0.15 stamped on it. Need to know what does it mean please. Hi Fadia, thanks for asking. The 18KT part of the stamp, of course, indicates that the piece is 18 karat gold (approximately 75% pure gold and 25% alloy metals). The 0.15 part of the stamp is trickier. That could indicate a total diamond weight for the piece, it could be a style number of some kind, or it could be a manufacturer’s mark. Without seeing the piece in person, it’s difficult to say which it is. I have an earring with a stamp on top of the locked “CF” then at the bottom is 14K585. What does CF mean? Thanks. Hi Maria, thanks for asking. The “CF” is most likely a manufacturer’s mark indicating who made the piece. I’m not familiar with which particular jeweler uses that mark though. Hopefully that helps a little. Hi, I was passed down a family members bracelet. On it on the clasp has like serial numbers which are: 3,984,900. On the little gold piece that connects the clasp to the bracelet it is stamped: 18K P.G. I have tried to find a maker who is the P.G. & also if this is pure 18K gold. If it is 18K gold, what would a piece like this possibly value at? Any info would be greatly appreciated! Thanks so much! Hi Jo, thanks for commenting. You are right that the “P.G.” is most likely a manufacturer’s mark. Unfortunately, we aren’t familiar with that particular manufacturer. Without seeing the piece in person, we can’t really give you an accurate ballpark estimate of the value. If you would like, you can send some pictures and additional details (gram weight of the piece would be great) to us in an email, and we can give you an estimate. Hi Allen, good point. It is entirely possible that the P. G. means Plum Gold, but that is not a usage that we have seen very frequently. Most of the time, plum gold is indicated with a p after the quality mark (i.e. 14kp or 18kp) or the word “plum.” That said, in the absence of any other obvious maker marks, we would assume the P.G. refers to the manufacturer. I suspect that 3,984,900 may be a patent number, especially when they include the commas. This patent number is directed to a coupling or clasp. Go to Google Patents, enter the number, and read what the patent says. Does your bracelet have anything like what this patent shows? Thanks for chiming in Steven. That is very insightful. I have a pair of white gold hoops with diamond chips. I know they are ‘real’ gold (at least an auction house said they were but would not tell me the karat weight unless I was willing to pay quite a lot for a full appraisal). They seem to only be stamped with the number ‘2’. Would you have any idea what this means? I assume there is no such thing as 2 Karat gold? They weren’t too expensive, so I suspect they would be between 9-12 karats at most. Thank you! Hello, thanks for commenting. 2, by itself, is not a stamp that I recognize as having anything to do with the gold quality. There may be a tiny gold quality stamp on or near the earring post that you can read with magnification. Beyond that, the 2 could be part of a 12k stamp that has otherwise worn away. If that is the case, the piece is most likely gold filled (1/20th to 1/40th gold with the rest being a base metal), since 12k gold is almost exclusively used in gold filled jewelry. I’m not certain if this is where I would ask a question about a ring. I have a gold ring that appears to have 14 karat gold stamped on the inside but the actual mark is the caret symbol “^”. So the stamp is 14^. Is this common? Of any significance? I haven’t been able to find anything online … so far. Thank you. Hi Kristen, thanks commenting. Without seeing the ring it’s hard to say for sure, but I can imagine a few possible scenarios here. First, there could have originally been a “K” after the 14 but part of it has been worn away leaving what looks like a “^” symbol. Second, the “^” symbol could be a manufacturer’s mark indicating who made the ring, and the 14 may be a style number or may be unrelated to the karat purity of the metal. Finally, a jeweler could be trying to be clever by using the “caret” or circumflex character to indicate 14 “karat” gold. We haven’t seen that particular usage before (it’s certainly not a standard jewelry purity stamp), but it is possible. If you are curious, you can always bring it by the shop and we can test the metal to tell you exactly what it is. Hi, I have a pendant that is marked 14KC. I am wondering if this is 14k or 14k clad? I have searched the internet but can’t find any information on the markings “KC”. Hi Barbara, thanks for reaching out to us. We’re not familiar with a standard meaning for that stamp. It is certainly possible that it means the piece is plated (14k clad), but without seeing it in person, we can’t say for sure. I bought a silver necklace that has Mexico. 10-01 stamped on it, what does that mean? Hi Robin, thanks for commenting. Most likely, the 10-01 is what the designer uses to organize their line of jewelry. It’s not talking about the type of metal used. Hi there, I have a few rings that were given to me and inside them I have noticed “10k” stamps. They are yellow gold and each have gemstones that are set quite different to what I’m used to seeing. Anyway, they seem to be a bit too yellow, more like 18k? But the stamp definitely says 10k. I’m not sure if they are real? Hello, that’s a good question, thanks for asking. Without seeing the piece (especially how the gems are set unusually), we can’t say for sure what’s going on, but there are two likely explanations. First, the pieces could be 10k gold that have been plated with high karat gold plating solution. It is very common for gold plated jewelry to look more yellow than unplated jewelry. Second, the stamp could be fraudulent and the pieces are actually costume jewelry (which often has a rich yellow color). As I said earlier, without seeing the piece in person, we can’t really say for sure, but hopefully those options helped a little. Hi, I have a ring that is stamped 14k, and has a symbol that looks like a skinny upright trapezoid with a line runny through it. Any idea what this is or who the marker maybe? I’ve been searching every where with no luck, and not ready to go to a jeweler! Mainly cause its hard to find a trusting one. Hi Jere, thanks for reaching out to us. As you know, the 14k stamp means the ring is approximately 58% pure gold and 42% alloy. Unfortunately, I’m not familiar with the trapezoid symbol, so I can’t tell you which manufacturer uses it. The problem with trying to track down a symbol like that is that it could be used by any one of thousands of companies from large multi-national corporations to a single goldsmith working in his garage. That said, we will keep our eyes open and let you know if we see it. Please post back if you find out what it is as well. I am currently looking on Etsy for a band and the choice of materials includes 14k and 18k yellow, white and rose gold F-VS… What does “F-VS” mean? And those options are more expensive. Hi Krissylu, thanks for asking. The F-VS part is not referring to the gold purity but the diamond quality. The F indicates the color (in the colorless range), and the VS indicates the clarity (meaning the diamonds range from VS1 to VS2). The Etsy seller may be grouping different diamond qualities with different metals (e.g. 10k gold with H color and I clarity diamonds or 14k gold with F color and VS clarity diamonds). Hopefully that helps, and if your interested, you can see pictures and read more about the 4 C’s of diamonds on our article. My gold chain is 10kt Yellow Gold Air Solid Curb Chain 20″ 3.45MM made in Italy. The stamp is star 763 vi. It’s so light, not that heavy. Is it real gold or fake? Plus I can bend it with my finger nails. Does real gold bend? As a side note, the fact that gold bends easily is actually one of its most valuable qualities. It’s part of what makes gold so workable and it’s one of the reasons why people throughout history have valued gold so much. Thanks for the info out there… Do you have any clue about the L*a*b* color space values of Pure 24k?? Hi Mario, thanks for commenting. The Lab color space is definitely a cool way to describe color, but I have never heard of its application to jewelry or gold specifically. The visible color that a piece of pure, 24k gold would appear is dependent on a lot of external factors: the ambient lighting conditions, the polish or lack there of on the piece of gold, etc. The best I can say is that when seen next to alloyed gold like 14k or even 18k, 24k gold has a richer, more vibrate yellow hue. Hopefully that helps a little, and feel free to post back with more specific details about what exactly you’re asking if you want to talk more. Hi Suzy, cameos are so fun, enjoy it. Unfortunately, none of those stamps appear to be talking about the type of metal used. I think they are manufacturing marks, for example 024 could be #24 of the total run, but that’s mostly speculation. In order to give you an accurate evaluation, I would need to see the piece in person. Please feel free to bring it by the shop anytime. I inherited a ring that is stamped 14K 969 JTC on the inside of the band that looks like a “comfort band” not quite round and with 4 small diamonds. What does the 969 JTC represent? Hi Ter, thanks for thinking of us. The “969 JTC” stamp is a manufacturer’s mark that has been used by the Zale Corporation to identify their jewelry. It doesn’t tell you anything in particular about the piece except that it was made by Zales. Hopefully that helps. Hi, I have a 22 inch 10k gold men’s figaro chain made in Italy stamped star 763vi air solid. What does that mean? Hi Tom, thanks for thinking of us. The 10k portion of the stamp, of course, indicates the metal purity (about 41.6% gold). The “star 763vi” stamp is most likely a manufacturer’s mark and/or possibly a style number of sorts. From my research, it seems like the “air solid” part of the stamp indicates that the piece is hollow. I can’t say 100% sure, but that is impression I got from a few different sources. You can usually tell if a piece is hollow by comparing the weight of it to a similar piece that you know is or is not hollow. I’m trying to see if my bracelet is real gold. It has 14k on one side and on the other end it has 535. Can you tell me if it is real gold? Hi Margie, thanks for commenting. Of course, without seeing the bracelet in person, we can’t say for sure if it is real gold. But, I can tell you that the 535 stamp is not a common one in the jewelry industry. However, 585 indicates that the piece is 14k gold (which is approximately 58.5% pure gold). If it is actually an 8 instead of a 3 in the middle of the stamp, then both stamps would mean that the bracelet is 14k gold. If it is a 3, then it might be a manufacturer’s mark or style number of some kind. Hopefully that helps a little and feel free to contact us if you have any more questions. My name is Mike. I’m from Pittsburgh, PA. My mother gave me a ring a long time ago with a little diamond in it and told me to give it to someone special someday. Well I still have the ring and have a question. In the inside, it reads on one side 14KP and on the other side it reads ROD 14K. What does this mean and is it worth something? Hi Mike, thanks for the comment. It’s not terribly uncommon to see a ring stamped with 14k twice, but it can be a bit of a red flag. This is because people will sometimes stamp fake gold with genuine markings in multiple places hoping that the stamps will be seen and believed. That said, it is more than likely that your ring in genuine 14k Plum Gold (we would need to see it in person to say for sure though). The “ROD” portion of the stamp is most likely a manufacturer’s mark indicating who made the ring. As for it’s worth? That is difficult to say without a lot more information (diamond size and quality, gram weight, etc. ), but a 14k gold and diamond ring generally has good resale value on secondhand markets like Craigslist and eBay. Hi Porsha, thanks for commenting. Without seeing the ring, it’s hard to say for sure, but it looks like the .23 part of the stamp refers to 0.23 cts which would be the total diamond weight of the ring (possibly excluding the center stone). The 14k part indicates that the ring is made out of 14 karat gold (or about 58.3% pure gold with the rest being alloy metals). The pwj part of the stamp is a manufacturer’s mark indicating who made the ring. In this case, the most likely candidate is Paul Winston Jewelry who is a fairly large manufacturer focusing on bridal jewelry. Hi Joel, that sounds like a special piece. The 10KR stamp most likely just means that the piece is 10k gold with the R being a manufacturer’s mark indicating who made the piece. Of course, 10KR can also mean that piece is 10 karat “rose” gold which is a red or pink color. But, the metal color is not generally indicated on the stamp. Hopefully that helps a little, and feel free to contact us if you have any other questions or need any work done of the ring to make it wearable for you. Hi, I know that gp on jewelry means gold plated, but what does a ring stamped with the letters pg stamped on them mean? The pg is the only mark on the ring. Hi Robert, thanks for commenting. PG doesn’t have any special jewelry meaning that we are aware of. So, it is most likely a manufacturer’s stamp indicating who made the piece. I have a 14k gold anklet but it is stamped with WG but it is yellow is it white and yellow gold mixed? Hi Pedro, thanks for thinking of us. Without seeing the piece in person, we can’t say for sure, but my guess would be that the “WG” refers to the manufacturer who made the anklet and not the color of the metal. Of course, it is also possible that it is a 14k white gold piece that has been plated yellow. If you are able to bring it by the shop, we can tell you for sure what it is. Hi, I have what we believe is a 24k gold Egyptian ring minus the stone but is still 7 grams, which was given to my mum 60 years ago in Switzerland. And I have a certificate or a description about it from an Italian jeweller (60 years ago) who I believe tested it. I’m interested in in knowing what its worth. It has no stamps that I can see which seems unusual. I can send a photo of it and the description. Can you help? Thank you. Hi Mario, thanks for reaching out to us. That sounds like an interesting piece. Yes, please email us some pictures along with any details you have, and we can try to help you determine how much it might be worth. What does 14k ME mean? Can’t get any info on it. It’s on a ring. Hi Mike, thanks for asking. The “ME” is most likely the manufacturer’s stamp for the company or person who made the ring. It’s always hard to track down exactly who the stamp refers to, but if you do find out, post back here in case anyone else is looking for the same stamp. I have a ring my daughter found in a parking lot it is marked 10kt dgla and has what I assumed were fake stones in it. What did she find? Hi Emily, thanks for thinking of us. From the stamp, it looks like the ring is 10 karat gold, and it was made by a company or individual who uses the stamp “dgla” to identify themselves. Beyond that, we couldn’t say anything about the stones without seeing them. If you are ever in the Sacramento area, feel free to bring the ring by for a free evaluation. Hey what does ‘G’ stamped on a gold ring stand for or mean? Is it really gold? Hi Tara, thanks for commenting. A “G” stamp by itself doesn’t have any generally accepted meaning that we are aware of. Of course, if the stamp was originally “GF” and the “F” has been lost over time, that would indicate that the ring is Gold Filled and not solid gold (meaning only 1/20th to 1/40th of the ring would be gold). Hopefully that helps a little, and let us know if you have any other questions. Similarly, I purchased a pair of large opal doublet earrings that are marked 10G on the earrings but 14K on the posts. I was told these were 14k all around…did I get ripped off? Thanks! Hi Carol, good question. The “10G” stamp is most likely a manufacturer’s mark. The 14k stamp on the earring posts indicates that the posts themselves are 14k. That said, unless there is a contradictory stamp on the main body of the piece, the industry standard is to assume that the 14k applies to the entire piece. Of course, without seeing the earrings, we can’t say for sure, but from the stamps, there’s no reason to assume you got ripped off. What does the letter p with a circle around it mean after 14k mark? Hi Theresa, thanks for asking. That stamp most likely indicates that the piece is 14k plum gold, meaning it contains precisely 58.5% pure gold. Hi! My boyfriend recently proposed to me. The ring he gave me has a stamp 750 and a separate marking on the other side indicating D015ct. It has a 7 stone floral designed gem I am not sure if it is real diamond. May I know what are those markings mean? Hi Marnelle, thanks for commenting. The 750 stamp indicates that the ring is made out of 18 karat gold (about 75% pure gold and 25% alloy). The other stamp is a bit more cryptic. My guess is that it means the total diamond weight is 0.15 carats. Without seeing the ring though, it’s difficult to say for sure. If you are in the Sacramento area, you can always bring the ring in and we can test it for you. If not, look for a local GIA trained gemologist and see if they can evaluate it for you. Hi Anthony, thanks for asking. The “fm” is most likely a manufacturer’s mark indicating who made the ring. Hi, I have a yellow gold ring with the imprint 14K GB. Could this be real 14kt gold or does the GB mean it’s gold plated or bonded? Thanks in advance for the feedback! Hi Garon, good question. The stamp indicates that the ring is 14 karat solid gold. The “GB” portion is most likely the manufacturer’s mark referring to the person or company who made the ring. Of course, if it was “GF” instead of “GB”, then that would mean the ring is gold filled and only a very small fraction of it would be 14k gold. Hi Adrian, good question. The 14k stamp definitely indicates that the piece is 14k gold, but we would need to test it in person to say for sure. As for the other stamps, the circled C is most likely a copyright indication letting people know that the pendant design has been copyrighted. And, the WB likely refers to the manufacturer who made the piece. Good day I have a necklace stamped ITALY 750 what does this mean? White silver is it real or only silver? Thanks for the answer. Hi Nerissa, thanks for asking. The ITALY 750 stamp indicates that the piece is 18k gold and was manufactured in Italy. If the stamp is accurate, it looks like your necklace is 18 karat white gold. I recently purchased a gold necklace and the stamp on it reads AG10K. Do you know what the AG stands for? Hi Fabian, thanks for commenting. The AG could stand for two different things. It is most likely a manufacturer’s stamp indicating who made the necklace. Alternatively, AG is the chemical symbol for silver, so it is possible that the stamp means that part of the piece is silver and another part is 10k gold. Without seeing it in person, we can’t say for sure which of these meanings is the right now. I have a Masonic ring stamped 10 KA KA? Hi BJ, thanks for commenting. The 10k part of the stamp most likely indicates that it is 10 karat gold. The rest of the stamp likely refers to the manufacturer who made the ring or it may possibly have some Masonic significance. Thank you for your prompt reply. The KA twice has no masonic significance. I suspect it has no other significance either. You are welcome, and thanks for confirming that. It is most likely a manufacturer’s mark then. Hello, I just purchased a 8.5″ bracelet for my husband. I’m concerned about it because it feels too light. It’s a kind of dark yellow. It’s stamped 14k Italy air solid. Please help me find out if it’s real? Hi Kassandra, thanks for reaching out to us. Another person commented about a similar stamp a while ago. From my research then, it seems like the “air solid” part of the stamp indicates that the piece is hollow. I can’t say 100% sure, but that is impression I got from a few different sources. That would also explain why the bracelet feels so light. An 8.5in men’s bracelet in solid 14k yellow gold should definitely have some heft to it. If it is hollow, that’s not the end of the world, it just means that you have to be more careful with it to avoid dents which can’t normally be taken out. Hi Donald, 14k Plum IDI most likely means that the ring was made with 14k plum gold. That means that alloy was mixed extremely precisely at a ratio of 58.5% pure gold and 41.5% alloy. That said, plum gold is normally stamped 14kp, so it’s possible that the stamp means something else. The IDI part is most likely the company that made the ring. Why does my gold ring have 37 C stamped on the inside? What’s that mean? Hi John, thanks for asking. I’m not familar with that stamp. It could possibly indicate that there are 0.37 carats of gems in the ring. Or, it could just be a manufacturing stamp. Without seeing this one in person, I can’t really say for sure. I found the numbers 147206 on the side of a filigree clasp on a necklace. What do these numbers mean? Thank you. Hi Carolyn, thanks for commenting. A number like this is most likely a style number or SKU number to identify the style of necklace. It might even be a serial number depending on the type of piece. The number doesn’t have any special jewelry significance that we are aware of. I have a ring with pso on the inside, but it looks like the diamonds are on top. They have air holes for breathing but the ring looks like cooper now that it’s old. Hi James, thanks for commenting. The “pso” stamp is most likely a manufacturer’s mark of some kind. Without seeing the piece, I can’t say for sure what it is made out of, but if it is discoloring like that, I doubt that it would be gold. Hopefully that helps. I bought a handmade Labradorite ring at an auction and though the guy said it was 925 Sterling, I just noticed the band is actually stamped 23C. Do you know if this mean it is 23 karat white gold? Thanks! Hi Lily, thanks for asking. No, there isn’t any white gold that is 23 karat. I suspect that mark is talking about the manufacturer or giving you details about the stone. Maybe it’s a 23 carat gem? Hi Jared, thanks for the comment. That stamp seems to belong to a large manufacturer given how many requests to identify it we have seen here. Definitely post back if you are able to determine which company it refers to. We would love to know. My wedding ring is marked “pms 14k”. Purchased at Service Merchandise. I always assumed it was a mfr mark. Hi Julie, thanks for sharing. It’s interesting to know where a piece stamped “PMS” came from. In this case, it seems likely that Service Merchandise is not the manufacturer (who is associated with the stamp), but the retailer. All the same, it’s another piece in the puzzle. Post back if you find out anything more. Can you please tell me what the markings mean? I’ve looked everywhere. Thank you and God bless! I’ve figured out the wedding set, but not the ring stamped PD. I now acquired a men’s ring that looks to be white gold possibly platinum, it has GB14K P as the stamp. I took it to a jeweler and they were stumped. One said it was fake and the other said it was plum gold and that the GB are the makers mark. I’ve once again searched high and low for these combined markings with no findings. Hi Beckie, thanks for thinking of us. Without seeing the ring marked “PD” we can’t really take a guess at what that stamp means or what it is made out of. However, it seems unlikely to be gold given that it doesn’t have a traditional gold stamp (14k, 585, etc.). The ring marked “GB14K P” seems to be marked as gold (possibly plum gold). However, whether or not that marking is accurate is another mater entirely. We would need to test the ring to tell you if it is actually 14k gold. As I’m sure you know, the “GB” portion is most likely a manufacturer’s mark. Hopefully that helps, and if you are in the area, feel free to come by the shop for more information on your rings. PD stands for palladium if I’m not mistaken. Hi Candy, thanks for commenting. PD is often used to indicate palladium, but in those cases the stamp normally includes a fineness grade as well (e.g. “950 PD” to indicate 95% pure palladium and 5% alloy). It is possible that PD by itself means the ring is palladium, but it’s definitely not common in our experience. I have a 10K white gold blue star saphire ring and on the inside it is stamped 10k FJG and has 989 circled, what do the stamps mean? I know what the 10k means, but not the rest. Thank you,. Hi Jeanette, thanks for asking. The “FJG 989” part most likely refers to the manufacturer. “FJG” may stand for “Fine Jewelers Guild” which appears to be a large jewelry manufacturer from my research. The “989” part may indicate a particular style, lot, or line of designs. Hopefully that helps. Hi. I just recently bought a 14k white gold ring. It says G14k. What is your thoughts? Hi Justin, thanks for commenting. The “G” is most likely a reference to the manufacturer that made the ring. It doesn’t hold any special significance in the jewelry world. However, if it was “GF” instead of just “G” that would indicate that the ring is in fact “Gold Filled” and not solid 14k gold. Hopefully that helps. Which gets more ugly with crater like holes and deformations and uneven surface after years of wear 18k or 21k? I have a gold ring that I bought from Saudi Arabia. I don’t know its karatage but it has a stamp of F214 or F21 4. What does the stamp mean? Hi Ogo, thanks for reaching out to us. In general, 21k gold will be softer than 18k gold because there is more pure gold in the alloy and pure gold is a very soft metal. So, 21k will be more susceptible to getting bent out of shape or uneven in surface than 18k gold. As for those stamps, they don’t have any general meaning that we are aware of. They are likely manufacturer’s marks of some kind. I just visited a local pawn shop today and presented a 7 inch gold, hinged, etched bangle bracelet I had purchased from QVC about 20 years ago (at time of purchase, it was sold to me as real gold). They initially offer me $180.00 either pawn OR sell..it passed magnet test and the only marking was a 1/4 inscription on the thin connector when bangle is opened. They then applied chemicals (after mentioning it passed color gradation test) and said 10k..among others..showed up. They then suddenly returned it to me and said it wasn’t gold..would’ve take it..I asked them what it might be then..NO reply..I left embarrassed. What does 1/4 mean? Hi Jennifer, thanks for commenting, and I’m sorry to hear about your experience. My guess is that the “1/4” stamp is actually part of a “1/40” stamp which would indicate that the piece is Gold Filled and not solid gold. That stamp means that 1/40th of the piece is gold and the rest is a base metal. Gold filled jewelry can have many different stamps like: “12k 1/40” or “10k 1/20” or “14k GF” depending on the exact materials involved. That would explain why the pawn shop did not want to buy the piece, but I don’t see why they couldn’t have explained that you themselves. Hopefully that helps a little, and I’m sorry again to hear how you were treated by both companies. I have a ring found at an old consignment shop. The ring is a 1ct, 3 prong eternity band said to be 18k. What does the stamp B 34 on the inside mean? Hi Sarah, thanks for commenting. That sounds like a lovely ring. Unfortunately, I can’t say for sure what the “B 34” stamp means. It is most likely a manufacturer’s mark indicating who made the ring. But, it is also possible that it is a style number or some description of the piece (34 stones perhaps). There is no standard meaning of that stamp that we are aware of. Hopefully that helps a little. Hi I was doing some landscaping and I found a 14k ring marked P(underscore)ms and I haven’t found the meaning of the Pms. I know it could be a marking for a manufacturer or maker but I cannot find the company. Do you have any information? I see other people have the same problem but it is a question burning my brain!! If you might have any information please help! Hi Tyler, thanks for commenting. Yes, you are right that the PMS stamp as you describe it likely refers to the manufacturer. It must be a popular/large company given how many people have mentioned it on this page alone. Unfortunately, I have not been able to determine which company it is. If you do find out, please let us know. Hi Marcelo, thanks for reaching out to us. The 14k stamp indicates that the piece is made of roughly 58% gold and 42% alloy. The “a/c” portion is mostly likely the manufacturer’s mark which indicates who made the piece. Hopefully that helps, and let us know if you have any other questions. Hi have a question I have a diamond ring it says 14k and the # 37 what does the #mean?? Hi Ginger, thanks for commenting. The “# 37” is most likely either a style number for the piece or a manufacturer’s mark. It doesn’t have any general meaning in the jewelry world. Hopefully that helps. I just received a ring that looks older, ruby and white sapphire, but inside it is marked with a triangle and ADC 14k. Is the ADC just a manufacturer’s mark? Any ideas??? HI Penny, thanks for commenting. Yes, the ADC stamp as well as the triangle are most likely just manufacturer’s mark. Hopefully that helps, and please let us know if you have any additional questions. I have a white gold engagement ring marked inside with 14K*. What does the asterisk mean? The ring has also lost a lot of its luster over the years and someone told me it looked as if the ring was “gold dipped”. HI Debbie, thanks for commenting. The Asterisk is most likely a manufactures stamp, or it was something else but wasn’t stamped perfectly so it looks like an asterisk. It’s hard to say without seeing the piece in person. It can be difficult to tell if a ring is solid gold or only gold plated as you suggested. A competent gemologist or jewelry appraiser should be able to let you know. One other thing you can do is have the ring polished at a local jeweler. If it’s 14k, the original shine and luster will be restored, however, if it is plated, the polishing will remove the plating and dramatically change the look of the ring (maybe not what you are hoping for). Hopefully that helps, and if you are ever in the Sacramento area, we would be happy to take a look at it for you. Good day, I have searched the Internet for a several days hoping to find an answer to my question. I was losing hope until I stumbled upon your website. BTW, it is very kind and generous of you to answer questions to people concerns about their jewelry. My husband recently upgraded my wedding ring set for our 25th anniversary. The bridal set is 2.5 C.T in white gold. I had it sized. It fits perfectly, I couldn’t be any more happier than my husband’s generous gift. Inside the band is an engraved mark that resembles a cursive lowercase “L”. Are you familiar with this mark? Hi Ana, thanks for commenting and for the kind words. It sounds like you have a beautiful piece there. Unfortunately, we aren’t familiar with a standard jewelry stamp that looks like a lowercase cursive “L”. With that in mind, I would assume that it is a manufacturer’s mark indicating who made the piece. Hopefully that helps a little, and we wish you the best. Did you ever find out what it (cursive “L”) was? I found a gold 10k bracelet in an old jewelry box I bought at a thrift shop…but don’t know what the L meant. I thought it was fake and gave it too my toddler to play, but if your husband got you a nice gift with the same stamping I’m wondering if it’s really real and maybe take it back. Hi Ana, great job on discovering that the L stamp refers to Landstrom’s jewelry. I thought I would also point out really quick to any other readers that if the bracelet was indeed stamped L10k, there is nothing there to indicate that it’s fake. From that stamp alone, we can say that the bracelet is at least claiming to be solid 10 karat gold. I have a diamond ring with 14 Kw P stamped on the inside. The P is stamped inside off square. I was wonder what that means. Hi Gretchen, that’s a good question. Normally, with the stamp “14k P” the “P” stands for Plum gold which means the jewelry is made out of exactly 58.5% gold and 41.5% alloys. This is in comparison with most 14 Karat gold which normally assays around 56% gold content from our experience. Of course, given the position of the stamp, it is also possible that the “P” is simply the manufacturer’s mark. It’s difficult to say without seeing the piece in person. Hopefully that helps. Hi I bought a white gold necklace and a ring at the mall. They’re both 14k. I tried to pawn them to check its purity, the ring is ok but they didn’t accept the 585 white gold necklace. I was confused. Is it fake? There’s a mark saying (585 2) on the pendant and 14k italy on the chain. Hello Tere, thanks for commenting. That sounds strange that they wouldn’t offer you anything for a chain stamped 585 2. Unfortunately, there are chains out there that are fake but are still stamped with 585 or 14k. If I encounter one of these chains, I tell the client about it right away. It’s strange that they wouldn’t give you an explanation. If you have a very strong rare earth magnet (available at most hardware stores) you can check and see if it’s the most popular fake. Often times, these fake chains are slightly magnetic and the real ones aren’t. Be sure to test an area away from the clasp though. The clasp will almost always be magnetic (on real and fake chains) because of the steel spring. Same problem on a white gold chain stamped 14k italy. Took it to several places who said was fake. So removed the rhodium plate by reverse electroplateing it. Now it’s a dull brownish yellow gold piece. Very strange? Poor quality metal alloy perhaps? Hi Dan, thanks for contacting us. Based on your description, it sounds like the piece probably doesn’t have any gold in it. It is likely a base metal (copper perhaps) that was plated white. Of course, we can’t say for sure without seeing it in person. Feel free to come by the shop sometime, and our gemologists would be happy to take a look. To Arden Jewelers I have a ring that is stamped 14K MO I would like to know what does it means? Please and thank you in advance. Hi Maribel, thanks for reaching out to us. The “MO” portion of the stamp is most likely the manufacturer’s mark, and the “14K” of course indicates the gold purity (approximately 58% pure gold). Hopefully that helps. What does RSO stands for? Hi Kiler, thanks for commenting. “RSO” does not have any special meaning that we are aware of in jewelry. So, it is most likely a manufacturer’s mark indicating who made the piece. Unfortunately, I don’t know which company or individual it refers to though. Hi Kristin, thanks for commenting. It’s great to hear when we were able to help someone. A Lindy Star is a type of synthetic (man made) star sapphire that was commonly used in jewelry in the 1950s to 1970s. You can often see a small “L” stamped on the stone to indicate it’s a Lindy Star. Hopefully that helps, and feel free to ask if you have any other questions. Hello. I have just bought a secondhand white gold and diamond bracelet which has no hallmark. However, it looks as though somebody has engraved the following on the inside: RD.18K.0,32 (although the R could be an L or even a 2). Is this normal please? Thank you. Hi Tracy, thanks for commenting. That stamp is a tough one. Of course, the 18k portion indicates that the piece is 18 karat gold. The “RD” and “0,32” parts could mean that there are 0.32cts of rounds diamonds, but that’s mostly speculation. The rest of the stamp could also be the manufacturer’s mark and style number. It’s not entirely uncommon for quality marks like this to be engraved instead of stamped, but it can be a bit of a red flag. We would have to look at the piece in person to say for sure. Hopefully that helps, and we wish you the best with your bracelet. Hi, I purchased a yellow gold and onyx ring from a local pawnbroker but it’s now turning my finger red and itchy (no allergy I wear other rings). I’m now doubting if its really gold. It has 375 stamped with a diamond shape around it and next to that says Italy. I’m very confused as I’ve never seen 375 stamped inside a diamond shape. Any help would be great, thank you. Hi Gregory, thanks for commenting, and I’m sorry to hear about the experience you are having with that ring. As you may have seen in the article, 375 usually indicates 9 karat gold. This means that the ring has a very low percentage of pure gold (around 37.5%) in it. So, there are a much higher percentage of other alloy metals than in other jewelry that you may own. This could explain your allergic reaction. You may have an allergy to one of the alloy metals in the ring that either is not present in your other jewelry or is present in such a low concentration in your other jewelry that it wasn’t enough to cause an issue. You might check out our article on allergic reactions to jewelry for some more information and tips. Hopefully that helps. The p letter is an italic style. Hi John, thanks for commenting. Discerning hallmarks like that on jewelry can be quite a challenge. From a little research, it’s reasonable to assume that the “S&W” portion is likely the maker’s mark (possibly indicating an English origin). The crown hallmark often indicates that the piece is gold, and the 18 may refer to 18k gold, but it may not. Unfortunately, I can’t be of too much help with the rest of the stamps. If you are in the Sacramento, CA area, you can always bring the piece by and we would be happy to look at it. Otherwise, I would recommend that you find a local jeweler who specializes in vintage and antique jewelry. They might be willing to help you determine what the rest of the markings mean. Hopefully that helps, and feel free to let us know if you have any additional questions. I have a white gold/diamond (or simulated stone) ring stamped w/ an indescribable swirl mark w/ 2 small dashes that resemble commas. The closest thing I’ve found resembles Egyptian letters but no match. This marking is followed with fancy cursive capital L*14K (the star looks just as it appears here, like an asterisk.) also 210 is stamped- presumably stone weight? I cannot find anything online. Ring belonged to my mother or grandmother. Totally stumped and emptyhanded with online search – may I send a photo to you? Hi Wendy, it seems like you have an interesting ring there. Thanks for commenting. Feel free to email us some photos. We may not be able to decipher the stamp for you, but we can probably give you some guidance on the piece itself. Was there ever anything figured out with this? I also have a ring with the L* stamp on it, and I’m stumped also!! Hi Danielle, unfortunately, we still have no idea what manufacturer uses the L* stamp. If you find anything out please post it here. We will definitely do the same. I finally found out what the “L” means. Sorry years later but it may help someone else. The fancy L stands for LANDSTROM’S jewelry it’s a blackhills gold trademark. Hopefully it helps someone else. Hi Ana, great work! Thanks for sharing that. What does the 969 stand for that is stamped on a 14k yellow gold piece of jewelry? Hi Heidi, thanks for commenting. From looking at a few of the other comments on this page, the 969 stamp may refer to the Zale company. It seems like they used to stamp some of their jewelry with it. Hopefully that helps. My ring says “CAP 14k” on the inside of the band. Do you know what CAP means? Hi Cathy, thanks for commenting. As you may have guessed, the CAP is the manufacturer’s stamp and the 14k indicates the quality. I am not familiar with which manufacturer uses the CAP stamp, and unfortunately, I wasn’t able to find anything through some quick searching. I have CAP on inside of my ring also. Did you ever find the maker? Hi Kathleen, thanks for commenting. We still don’t know who that stamp refers to. It does seem to be fairly popular though, so it’s likely connected with one of the major chain jewelers. If we find out more, we’ll definitely post something here. My ring says 14k JTC 969. what is the JTC and the 969? Hi Autumn, thanks for contacting us. If I recall correctly, JTC is an old Zale’s stamp and the 969 would be their code for the style of the ring. Of course, the 14k means the ring is about 58.5% gold and the rest is alloy. Hopefully that helps. I have a ring and it says “MW 4.50” what does that mean? Hi Priscilla, thanks for reaching out to us. That one is tricky. It’s not a stamp that we have seen before, and it doesn’t have any standard metallurgical or gemological meaning that we know of. The “4.50” portion could be a reference to the original ring size, but that is mostly a guess. Sorry we couldn’t be more helpful on this one. Please let us know if you are able to find out what it means. Hi I have a bracelet 18k oh. I wanna know is gold or plated. Is 18k pg. Hi Irasema, thanks for commenting. The stamps “18k oh” and “18k pg” could both indicate the piece is solid gold. Most likely the “pg” or “oh” are manufacturers stamps. Feel free to bring them by the shop and I can test them for you on my gold tester to be sure. I have a gold colored necklace with 10G stamped on the clasp. Any ideas what this means? Hello, thanks for reaching out. I have seen that stamp before on a gold plated piece although I’m not exactly sure what the G stands for. Remember, 10G is not 10K and if it isn’t stamped with its karat purity (10k, 14k, 750, etc. ), it is less likely to be solid gold. Hopefully that helps. Hello I have a ring that is stamped 10k GWR, and AIAG with a space in between the two stamps. I think the AIAG stamp is the maker’s mark. So I was just wondering what the GWR means since its right next to the 10k stamp. Any Ideas? Thanks! Hi Jon, thanks for commenting. It sounds like you did your homework on that one. Our gemologists don’t recognize the GWR stamp, so our best guess is that it’s either another part of the manufacturer’s stamp or it is some code that only has relevance to that manufacturer. Hopefully that helps, and feel free to contact us if you have any additional questions. Hello, I received a yellow gold ring from the late 1940s. On the inside on the ring it is engraved 14-18 K0 then there is a symbol that looks like an “F” placed on sideways facing down, followed by another “0”. The “0” and the sideways “F” also might be a key symbol as they are touching. Any idea what this means? Hi Christina, thanks for commenting. That sounds like an interesting stamp. Without seeing the piece in person it is very difficult to tell, but my guess would be that the piece contains some 14k and some 18k gold and the “0” and “F” or key symbol is an indication of who made the ring (a manufacturer’s mark). Since stamps vary so widely, it is almost impossible to say with certainty, but hopefully that helps a little. I have a wide gold bangle marked vol 10 ct it has no stones on it. I’ve taken it to stores in 2 towns. The most I was offered was $400, but Two out of about 10 “jewelers” literally threw the thing back on the counter with their nose up in the air saying it’s not real gold. It passes the acid test, but they don’t believe it’s gold :-/ Is it or isn’t it real with those markings? If so, what countries mark gold that way? I’m sorry to hear about your experiences. It doesn’t sound like you have been treated very professionally. The “vol” part of the stamp probably indicates the manufacturer/designer who made the bracelet. Normally, gold would be stamped “10k”. A stamp of “10ct” would normally mean that there are 10 carats of gems in the bracelet, but since you say it has no gems then it might be miss-stamped which is a red flag that something isn’t right about the bracelet. That’s about all that can be said from the markings alone. Of course, there is no substitute for being able to see the piece in person. If you are in the Sacramento area, we would be happy to have our gemologists take a loot at it for you. If not, and you are confident it is worth more, you could consider taking it to a reputable, local jewelry appraiser. With a written appraisal in hand, you may be able to get more for your piece (especially if you decide to sell it directly on eBay or Craigslist). Ct or C is what the Brits use as an abbreviation for our K.
Hi Kerry, thanks for the contribution. You are absolutely right. It must make things incredibly complicated when trying to differentiate between carats as a unit of weight (e.g. a 1ct diamond) and carats as a measurement of metal purity (e.g. this is 14ct gold). Let’s just say I’m glad we use karats with a K here in the States. I was given a ring that belonged to my great grandmother, it has a large blue stone and it says 14k with an inverted (upside down) triangle beside of it stamped inside the band. What does the triangle mean and how can I check if the stone is more than glass? Hi Angela, that’s a great question. An upside down triangle doesn’t have any gemological meaning that I am aware of, so it is most likely a manufacturer’s mark which indicates who made the ring. As for identifying the center stone, that can get tricky. Your best bet would be to bring it to a professional appraiser who is also a gemologist. They should be able to accurately identify the stone for you and give you an idea of how much it might be worth. If you are in the Sacramento area, we offer that service at no charge. Hi Jesse, thanks for reaching out to us. The “F & T” portion of the stamp is most likely a manufacturer’s mark (indicating who made the ring). I’m not personally familiar with that particular stamp, so I can’t give you any guidance on which company or individual it may refer to. Hopefully that helps, and feel free to let us know if you have any additional questions. Hi, how do I know if a diamond ring is genuine? My great, great grandmother left me what looks like a white gold diamond ring that is stamped CECIL 14k 585 along with a lot of other jewellery & dinner sets. I would like to insure it for my kids if it’s real so I can pass it on through the family. Should I go to a valuer or a jeweler or an antique dealer? I don’t want to get wrong information. Hi Lisa, that’s a good question, thanks for asking. I have seen a lot of “home tests” to determine if a diamond is genuine, but none of them are very reliable. My best advice would be to find a local jeweler with a GIA or AGS trained gemologist on site. If they have their own gemology lab on the premises, that would be ideal. Such a person should be able to tell you if your diamond is genuine or not. Of course, if you are in the Sacramento, CA area, we would be happy to evaluate the piece for you, and we also offer an insurance appraisal service. Hi! I got our wedding bands made in Argentina and they are 18k, but my fiance’s is a little too small so we have to resize it in Australia. Will the yellow colour be the same? Thanks! Hi Tere, that’s a good question. Thanks for asking. Most 18k yellow gold (regardless of which country it is produced in) will be very close in color, but there are definitely different alloys that have different colors. For example, some manufacturers offer a “Rich” or “Royal” yellow color 18k alloy that is more yellow than other alloys. That said, a competent jeweler should have a variety of alloys to choose from and be able to match the color of your ring within a small margin when sizing it. Our advice would be to visit the jeweler in person and ask if they will be able to match the color of your ring before leaving it for sizing. Hopefully that helps, and let us know if you have any additional questions. I have a 14k PMS wedding band what does the PMS stand for? Hello, thanks for commenting. The PMS part of the stamp is most likely the maker’s mark. It is interesting to note that there have been several other comments inquiring about this same stamp. I would venture to guess that this was the symbol of a popular manufacturer, but I haven’t been able to find any information about them. Let us know if you discover anything more about the piece. Hi. I have a question. My fiance bought my engagement ring from someone he knows. She told him it’s 14k gold and 2k diamonds. Inside of the ring it has 14KCCC , what does the CCC stand for? Hi Mariya, thanks for asking. It sounds like you have a beautiful ring there. The CCC part of the stamp is most likely a manufacture’s mark which indicates who made the ring. The 14k stamp is, of course, a good indication that the ring is 14 karat gold. Unfortunately, nothing in the stamp tells us whether or not there are 2 carats of diamonds on the ring. Hopefully that helps, and let us know if you have any additional questions. Hey I was wondering what does C14KP mean? I found a ring awhile back and on one part it has KP and on the other side has c14kp? It has a diamond in the center with two smaller ones, one on each side. There is a breather hole underneath ring straight under the middle diamond can that be real and valuable to? Hi Chris, thanks for commenting. The 14KP part of the stamp indicates that the piece is 14 karat plum gold. Remember from the article that this means the piece contains at least 58.3% pure gold. The “C” and the “KP” stamps are likely manufacturer’s marks which indicate who made the ring. The hole you see underneath the center stone is to help with the cleaning process. Dirt and grime can build up on the underside of gemstones over time which makes them less brilliant. The hole under the stone allows cleaning solution to come in contact with that part of the stone and clean off this build up. Without seeing the piece in person, we can’t tell you if it’s a real diamond or not, but most jewelry buyers will be able to test it for you. Hopefully that helps, and let us know if you have any additional questions. Hi Carl, thanks for contacting us. First of all, congratulations! Owning gold of any kind in your investment portfolio is a good idea. I would suggest you get familiar with the gold market. I use kitco.com; look at the bid price in your situation. For example, at the time of this writing, the bid price is $1,058 per 1oz of 999 or 24 karat gold. So, a 10oz bar has exactly $10,580.00 of gold at today’s market, and I wouldn’t pay more than $11,500 or very close to it to buy that bar. Of course, some gold coins have numismatic or collector value that can make them worth more than the market price, but since we are talking about gold bars for investing, the market price is what you should focus on. For bullion investing, try to get as close to current market as you can. I would also recommend getting physical gold and not going through a service that stores your gold for you as long as you can safely store the gold. I also recommend buying gold through a trustworthy, local bullion or coin dealer. Just understand the current market price before you make your purchase. Hello, I found a ring today and the marking inside says 14KPG there are no spaces or dashes. What does that mean? Hopefully that helps a little. Feel free to contact us if you have any additional questions. Of course, if you are in the Sacramento, CA area, you can always bring any jewelry you have by the shop for a free evaluation. Hi, I need to know. I received a ring for my birthday just yesterday. It’s got no carat/karat markings at all. It’s a thick band with small diamonds. Inside, it’s got a “c” inside a circle just like a copyright symbol. It also has “A/C” to the right of the copyright mark. What can you make of this? I am ready to purchase a 24″ Mariner gold chain with following stamps: 10KT–Italy–Air Solid–MO. This is stamped on one side of the clasp (Italy other side 10K). The other part of the clasp has Air Solid in a triangle and MO on the other side. What do these stamps mean? Hi Russell, thanks for commenting. As I’m sure you have guessed, the “10k” stamp indicates that the piece is made out of solid 10 karat gold (approximately 41.6% pure gold), and the “Italy” stamp indicates the country of origin. The other stamps are a bit trickier. From a little research, the “Air Solid” stamp might indicate a collection or possibly that the chain is hollow. It seems to be a common stamp on some Italian made chains, but it’s difficult to pin down exactly what it means. The “MO” stamp is most likely a manufacturer’s mark, indicating who made the chain. However, it is quite difficult to tell which company or individual the “MO” refers to. Hopefully that helps, and feel free to let us know if you have any additional questions. I have a wedding ring from my great-great-great grandfather that is a solid yellow band with a belt buckle decoration. It is engraved very deeply with a name in cursive opposite of a marking of “14-K.” Curious about the dash and the period after a capital K…. Any ideas? Thanks! Hi Jeff, thanks for commenting. That sounds like an interesting piece you have there. Most likely, the “14-K.” means that the ring is made out out 14 karat gold (which is 58.5% pure gold and 41.5% alloys). Each manufacturer has their own way of marking the metal purity (some use 14k, other use 585, etc.). So, it’s not unheard of to see the 14-K styled like it is in your ring. Hi, I wanted to ask that why gold jewelry can be made only in 24K, 22K, 18K, 14K, 10K, 9K and mainly in even digits only. Why not in 20K, 16K, 12K and other odd digits such as 21K, 19K and many more? Hi Nividha, good question. The answer is that gold can be made in virtually any purity you can imagine. Industry standards have evolved over time for the most common alloys (14k, 18k, etc. ), but there is no reason that other purity levels cannot be made. With that in mind, 12k is generally used in gold filled jewelry, but it should state 12k GF or 12K gold filled. Gold filled jewelry will often be stamped 12k 1/20 OR 12k 1/40 depending on how much 12 karat gold is used. Also, some designers, like Scott Kay, have experimented with 19k gold recently. Finally, 21k is actually a very popular alloy. It is often stamped 875. Hopefully that makes sense, and feel free to let us know if you have any additional questions. Hi, I have a lot of 9k gold rings and was thinking: is it possible to separate the pure gold out of them and make a 22k gold ring or is that a stupid question? Hi Craig, that’s not a stupid question at all; thanks for asking. 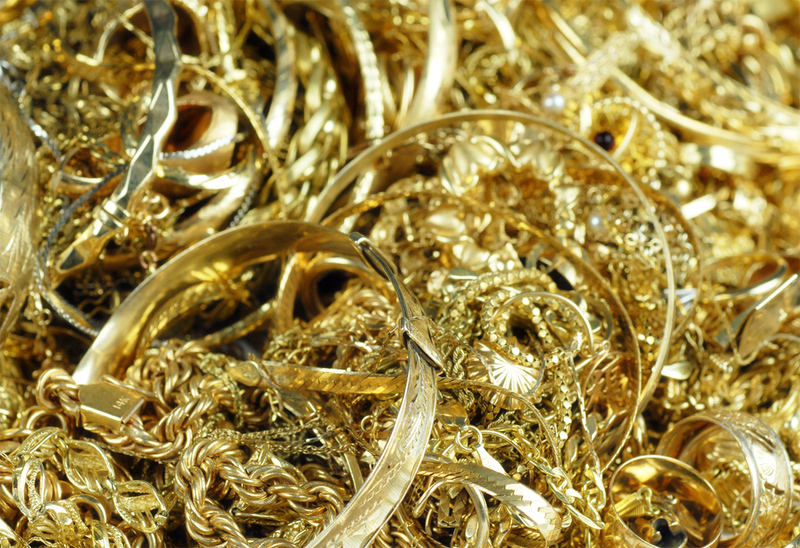 The process of separating pure gold from a karat alloy is called refining. It requires some specialized equipment that you will really only find at serious refining operations (not at a local jewelry store). Once the metal is refined, you should be left with roughly 35-37% of the original weight in pure (24k) gold with the reminder in alloy metals like silver, copper, nickle, etc. Of course, if you want to make a new piece of jewelry, the easiest and least expensive way would be to trade in your 9k gold rings for credit, and then we can custom design your new piece and use fresh gold to make it. Feel free to contact us, if you would like any additional info. Hi Linda, that’s a good question. It is definitely possible for the “C” to indicate something like that, but we aren’t aware of any industry standard for that type of usage. It would be more common for the “18C” stamp to indicate the manufacturer who made the ring. Or, it’s possible that it is a mis-stamp, or a worn stamp, and it should read “18K” which would, of course, indicate the purity of the gold. Hopefully that helps. Hi, I wanted to ask that you article above states “White gold is available up to 21 karats”. Why can’t it be made in 22 karats? Hi Nividha, that’s a great question. Since gold is naturally yellow, other metals have to be added (alloyed) to it to bleach it white. 21 karat gold is approximately 87.5% pure gold. So, there is only about 12.5% of the mixture available for the white metals that change the color. If that percentage gets any lower, there just isn’t a high enough ratio of the white metal additives to make the finished product truly white. I have a ring that has a stamp that says “14 G” on the inside and what appears to be a Smokey quartz as a stone. Can you give me some idea as to what the imprint means? Hi Leigh, thanks for commenting. That is an unusual stamp. Given that it doesn’t conform to industry standards for a quality stamp (14k, 585, etc. ), we would be hesitant to guess at what it means. Our best recommendation would be to have the ring tested by a gemologist to determine what the metal is. If you are in the Sacramento area, we would be happy to test it for free for you. Just come on by the shop. Hi. I have one question! I was looking at wedding rings and I noticed that the ring had 10kg what does the kg stand for? Hi Jennifer, thanks for commenting. I would say that 10kg normally means 10 kilograms 🙂 But, in this case it could mean 10 karat gold which was made by a designer that stamps their rings with a letter “G” or who doesn’t use the standard “10k” stamp. However, without testing the ring in person, I can’t say for certain what it is made out of. Hopefully that helps, and feel free to contact us if you have any additional questions. Hi there, I just purchased a two tone gold bracelet and after inspection I noticed that there is a capital “F” stamped in front of the 14K stamp. What does the “F” mean, should I be concerned that it is not real gold? Hi Cind, thanks for contacting us. The “F” is most likely a manufacturer’s mark that’s been put there to indicate who made the ring. Determining which manufacturer uses that mark can be a bit tricky, however. That said, there’s no standard meaning for an “F” near the 14k stamp, so the stamps seem to indicate that your bracelet is 14k. Hopefully that helps, and feel free to contact us if you have any additional questions. I want to buy a chain + bracelet from amazon. I’m wondering if I should go ahead and buy it, but I need some assistance first. On the description it says 18K White Gold Filled. What does this mean? Is it real or fake? Hi Osricky, that’s a good question. The important thing to note in the description is the “Gold Filled” part. This means that around 95%+ of the piece is not gold. It is a base metal that is covered with a very thin layer of 18k white gold. I wouldn’t call it “fake” because it is honestly described as gold filled. However, the piece is not solid gold. Hopefully that helps, and let us know if you have any additional questions. I have a white gold diamond ring with 14KT and RE37.201E could you give me some idea of what the second stamp could be? Hi Lub, that’s a good question. That second stamp is most likely a SKU or style number from the manufacturer. There isn’t any obvious information I can see in the stamp that would describe a piece of jewelry (e.g. carat weight, stone type, etc.). Hopefully that helps. I have a yellow gold 14k ring with a yellow color diamond. It’s stamped 14k on the inside of left side on the other side says PLUM does anyone know what Plum stands for alone with nothing beside it? Hi Emily, thanks for asking. There are two likely options. First, it may refer to the 14k being a plum alloy (i.e. it contains at least 58.3% pure gold). Second, it could be the name of the manufacturer who made the ring. Normally, 14k plum gold is indicated with the 14KP marking, but it is entirely possible that they just decided to separate the plum portion from the rest of the stamp. Unfortunately, the only way to know for sure what percentage of pure gold is in the ring is to have it assayed which is not something most jewelers have the equipment for (you would probably need to talk to a refiner). Hopefully that helps. I inherited a wedding band set from my mother’s estate, however the stamp is very worn down and we are unable to see the K. Is there a way to tell what it should be? Hi Dawn, that’s a good question. It is actually quite common for a stamp to wear off either partially or completely over time. If enough of the stamp remains, you can make an educated guess as to what it was originally. For example, if you can see most of a 14, but the K is missing, it’s generally a good bet that the ring is 14 karat given that “14” is unlikely to be manufacturer’s mark but is extremely common as a purity mark. The same rule applies to 18, 10, 585, 750. If you can make out part of these common stamps, you can have a good idea of what the complete stamp was originally. However, even with an intact stamp, you need to have the metal tested to be absolutely sure of what it is. We offer this service for free if you are in the Sacramento, CA area. If not, I would recommend calling around to local jewelers to see if they would be willing to test your band. I would further recommend that you avoid jewelers who will use acid or other destructive tests. We use a non-destructive metal test in 99% of our evaluations that is very accurate and does not damage the jewelry (some unusual pieces require more elaborate tests, but we always inform you of this in advance). I hope that helps, and we wish you the best with your mother’s estate. I just came across a gold wedding band among my deceased mother’s jewelry. It has PMS 14kp marked inside. I understand from previous answers what those markings probably mean. My question is who this ring may have belonged to. I don’t think it was either of my parents’ wedding band and wondering if it could have been my grandfather’s. He would have been married to Grandma probably in the late 1800’s. Would a ring with this marking have existed back then? Thanks. Hi Linda, that’s a good question. It’s entirely possible, but I haven’t been able to track down which manufacturer used the “PMS” mark. Unfortunately, without that information, I can’t give you any valid guesses on when the ring could have been made. You may be able to find an antique expert who knows that stamp by calling around to antique malls in your area. Beyond that, I will keep my ears open, but associating a stamp with a particular designer can be a challenging task. Please let us know if you find anything out. I have a gold wedding band, plain outside with and before that it has a diamond stamp with what looks like a “C” inside. I was just wondering what it meant? Hi Skye, thanks for asking. That stamp is most likely the manufacture’s mark. It can be quite difficult to track down exactly which manufacturer the stamp belongs to. With a stamp like that, it can be even more complicated given that a letter “C” could refer to almost anything, and it could even be a stylized copyright symbol. Sorry I couldn’t offer more guidance. Hopefully that helps, and let us know if you have any additional questions. Hi. When cleaning up after my dad passed i found a ring in with a few of his possessions. I thought it was a simple silver band but inside it was stamped pms 10k and i wasn’t sure if it meant anything at all. I was just wondering if I should maybe take it in to a jeweler or if it really is just a simple little band with more sentimental than monetary value. Hi Kay, thanks for commenting. The “pms” part of the stamp is most likely the manufacturer’s mark (indicating who made the ring). The 10k part, of course, means that the ring is 10k gold. If it is just a simple gold band, there probably won’t be too much monetary value in just the metal. You can definitely take it in to a jeweler to get an evaluation and a cash offer (we do a free value appraisal), but my guess would be that the sentimental value will be more than the cash on this one. Hopefully that helps, and let us know if you have any more questions. I have a woman’s ring that is stamped 14K with a triangle after. Is that another possible manufacturer’s stamp or does it mean something else? We have been told by a local jeweler that the red stone in the ring is not real. Hi Scott, thanks for commenting. You are right that the triangle is most likely a manufacturer’s mark. Those marks can take almost any form, and it can be very difficult to track down which manufacturer is associated with which stamp. I can tell you that a triangle does not have a standard meaning in the jewelry industry which is why I would say it is a manufacturer’s stamp. Hopefully that helps. My ring says 14kp 969 jtc and has a diamond raised up how much is it worth? Hi Holli, thanks for asking. The 14kp part of the stamp indicates that the ring is made out of 14k “plum” gold (precisely 58.3% pure gold). The 969 jtc part of the stamp is from the manufacturer. From some quick searching, it seems as though “jtc” is a manufacturer’s mark the Zale Corporation used to use to stamp their jewelry. The 969 part seems to be an indication of the jewelry style or product line. The question of how much the ring is worth is a little more complicated. In order to say for sure, we would need to see the piece in person. We can give you a rough ballpark if we had some more information (total gram weight, diamond size, color, cut clarity, etc.). Hopefully that helps, and we wish you the best. Hi guys, I have a gold ring that has AC24 stamped on one side and 375 on the other side. What do the stamps mean, please? Hi Kristy, thanks for asking. The “AC24” is most likely a manufacturer’s mark used to indicate who made the ring. It can be difficult to tell which company or individual the stamp refers to though. The “375” is most likely the quality stamp which indicates the percentage of pure gold in the metal alloy. A quality of 375 or 37.5% would indicate that the ring is made out of 9K gold (9 / 24 = 0.375). I didn’t have 9k on the chart above because it is less common than the others, but it is out there, so I went ahead and added it. Thanks for your comment. My wedding ring says pms 14kp, I understand that “kp” means karat plumb, but what does “pms” indicate? Hi Rusty, thanks for asking. The “pms” is most likely a manufacturer’s or designer’s mark. Whoever made the ring identifies themselves with those initials. Of course, determining which company or individual made the ring from the stamp alone can be quite difficult. Hopefully that helps. Hi Jamie, that’s a good question. There are a couple options for this one. First, the 4 could be part of a double stamp. Sometimes a ring will be stamped twice by accident, and it’s possible that on the second stamp only the 4 came out. Second, the 4 could be some kind of a manufacturer’s mark that indicates who made the ring. Third, some manufacturer’s put additional information about the ring in the stamps. Things link the total diamond weight or a style number could be stamped on the ring. In this case, the 4 could be part of an informational stamp and the rest has worn off over time. Hopefully that helps. Hi experts! My question is: on ebay I can see rings which say gold filled and 14k. So, is this a real gold ring? Or just gold plated? Because the price is only $4, so I’m pretty much confused. Please help me. Hi Rumana, that’s a good question. If they say the ring is gold filled and 14k, that means that it is made out of a base metal (e.g. brass) with a very thin layer of 14k gold on top of it. Common ratios are 1/20 or 1/40 which would equate to one gram of 14k gold for every 19 or 39 grams of base metal. This is different than gold plating which has much less gold, but with either gold filled or gold plated jewelry there is a very small amount of actual gold in the piece. Hopefully that helps, and good luck on eBay. Hi! I have a yellow gold and diamond ring that’s stamped 14K V4. I am absolutely clueless on the V4 part. What could it mean? Hi Deane, that’s a good question. The “V4” part is most likely a manufacturer’s mark. It’s there to indicate who made the ring. Of course, it can be quite difficult to determine which company or individual designer corresponds to which mark without additional information. Hopefully that helps. hi, i noticed one on my ring had the marking “14k key” What does the word “Key” represent? Hi Savi, thanks for asking. The “key” portion is most likely a manufacturer’s or designer’s mark. It can be difficult to determine exactly what manufacture it is though without more information. Hopefully that helps. Hi May, that’s a good question. The two most likely options are: 1) it is part of a quality stamp and the number has worn off 2) it is a manufacturer’s mark. I have seen quite a few rings where the quality stamp has completely or partially worn off, so that’s definitely a possibility. Hope that helps. I have just been given my aunts engagement ring from the 1970’s and it says P. G. 18. What does that mean? Hi Karen, that’s a good question. Without seeing it, it’s difficult to say for sure, but here is our best guess. The “P. G.” is most likely a manufacturer’s stamp used to indicate who made the ring, and the “18” is most likely stating that the ring is 18 karat gold. However, the “P. G.” could also mean “plum gold” which, combined with the “18”, would mean that there is precisely 75% pure gold in the alloy of the ring. Hopefully that helps. I have a ring stamped with “14k up” on the band. What does the “up” stand for? Hi Tara, thanks for asking. The “up” is most likely a manufacturer’s mark. Generally, manufacturers will put their logo, initials, or other identifying mark right next to the quality (14k) stamp. Of course, if the stamp was “14kp”, without the “u”, then that would indicate that this is “plum” gold meaning the alloy is precisely 58.3% gold. Hope that helps. I have bracelet with two stamps: “14K UP” and “Korea” . Please let me know what you think . thank you! Hello, thanks for reaching out to us. The 14k portion, of course, refers to the metal purity (about 58% gold). The UP is likely the name or initials of the Korean company that made the bracelet. Hopefully that helps. A brooch, given to me in the 1960’s. is stamped with 14KK … I have never seen this before and am wondering what it may mean or if it was simply an over stamp. Hi Tisha, that’s a good question. As far as we know, there is no “14KK” stamp. You’re probably right in assuming that this was simply a double stamp. It does happen occasionally.